%C2%A9 William Kentridge. All rights reserved. Processions are a recurring motif in William Kentridge’s graphic work and films. In Eight Figures, each character in the procession possesses attributes symbolizing their personal identity and social role. Featured are a miner, farmer, nurse or doctor, architect, and porters, who move from left to right along a narrow wooden ramp or boardwalk. Suggesting a theatrical performance, the scene takes place in an indeterminate interior bathed in harsh artificial light. The background is also ambiguous, punctuated with vaguely outlined figures, floating numbers, and vertical lines segmenting the space. Random words in English and Russian run along the edge of the stage-like ramp like advertisements, while various text fragments appear elsewhere in the composition. Porters appear regularly in Kentridge’s art, often shown hauling the symbolic burden of “white guilt” over the immorality and persistent consequences of institutionalized racial segregation (apartheid) that existed in South Africa until 1991. These and the other non-heroic figures signal a larger, perhaps endless procession of people trudging ever forward through daily life, their multi-faceted identities shaped by political, social, and personal forces. 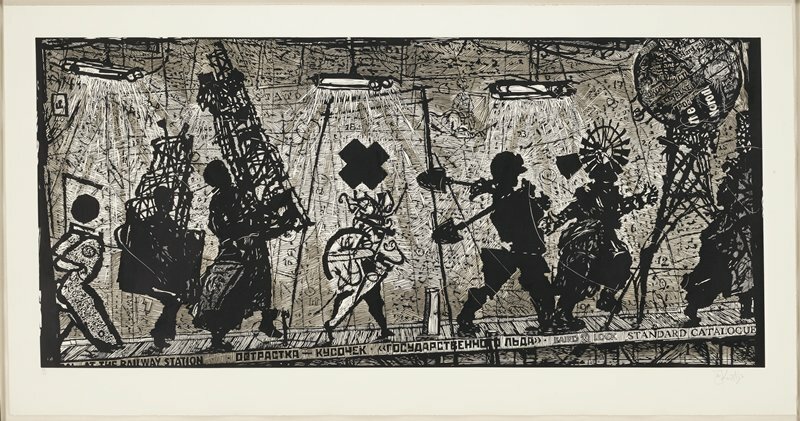 For Kentridge, the procession is a metaphor for society’s collective journey, a nomadic passage through life, but one that requires critique and self-evaluation. Though hopeful in its outlook, it is also a satirical commentary on the brutality, ignorance, and absurdity of modern life. Artist Proof Studio, Johannesburg, South Africa (publisher). (Osborne Samuel Gallery, London); sold to MIA, 2017.